While there is a wealth of information on the warsug forums, some of the content is quite old and hard to tell if it is still active, I have compiled a list of active frequencies. I live in Perth’s southern suburbs so your milage may vary. If you have any favourite frequencies please leave a comment below, another great resource is the ACMA’s Site Location Map, you can also turn on filters to only show licenses within your radios frequency range. While there is a lot of information online regarding the national broadband network, there is almost nothing online regarding the private greenfields fibre network LBNCo. There is some history behind LBNCo, including originally being named Service Elements and at some point obtaining the old E-Wire/BES network (and subsequently upgrading the HFC network to DOCSIS 3.0 and the FTTH network from EPON to GPON). In 2013 the then Service Elements network was opened up to other RSPs rather than the single Service Elements owned FuzeConnect (later renamed to FuzeNet). At first other RSPs were only able to resell a Layer 3 service, in 2015 Exetel were the first RSP selling their own Layer 2 access. Using the ACMA’s Register of Radiocommunications Licences I was able to see that LBNCo utilise a lot of wireless backhaul. In my experience it seems they will deploy a new estate with wireless backhaul and then upgrade when needed to fibre and in my estate there appears to be both a 5Ghz Ubiquiti NanoBridge and a licensed 18Ghz pair that both point at a local Optus tower. There is also another estate 15kms away that also points at this same Optus tower. Unsure of the exact situation there but I’m also aware that my estate was recently upgraded to have fibre backhaul and the wireless links left in place as a backup. (2017 Update: The licensed microwave link was taken down with only the Ubiquiti remaining). 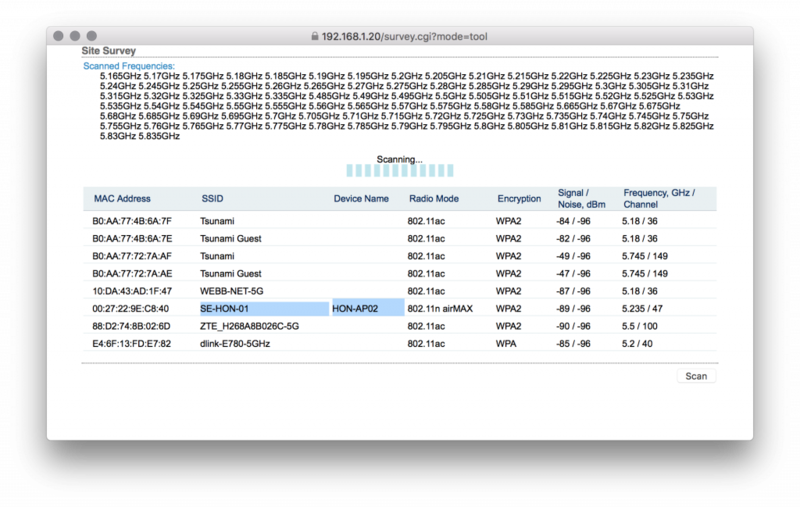 Studying the neighbours that my router can see I was able to find out that there is a lot of Mikrotik devices in their network. When on a layer 3 provider I can see that my router was connecting to a PPPoE server local to my estate, and after switching to a layer 2 provider I was able to see that the POI was another Mikrotik router located in QV1 . For what it’s worth – I have also been told that LBNCo have POIs in NextDC (Perth) and PerthIX. In my estate there are a number of houses who are not within the fibre footprint, LBNCo has provided them with PtP wireless. At the house end they are provided with a Ubiquiti LocoM5, these are either pointed at the same mast that hosts the wireless backhaul I mentioned above, or a streetlight. On both the mast and the streetlight it appears there is a Ubiquiti Rocket strapped to the back of a Ubiquiti AirMax sector antenna. From what I understand the only RSP available on the LBNCo wireless network is FuzeNet with 25Mbps being the highest speed offered. From my house I am able to see one of these APs with reasonable signal strength. In terms of FTTH equipment, I’m provided with an Aurora ONT-G4021-FRU-C, but I’ve seen Aurora ONT-E132X being mentioned on Whirlpool, although apparently they were being replaced (probably during the EPON to GPON upgrade). The other half of my estate was upgraded from the Aurora NTDs to Huaweis, I have also discovered that there are some AllOptics NTDs in the network too which are apparently limited to 50Mbps. Interestingly I haven’t seen any obvious fibre distribution hubs around my estate which is quite nice. Unfortunately LBNCo aren’t a Dial Before you Dig member so I’m unable to pull maps. The FTTH LBNCo network in my estate also provides both FTA TV and Foxtel via a technology called RF Overlay or RF Over Glass. The Foxtel signal is received by a satellite and then transmodulated to the same frequency as their cable service. This signal is then combined with the FTA signal, which is then converted to an optical signal. This optical signal is then converted back to electrical signals at the ONT which is installed at the house. When ordering Foxtel it is important to let them know that you are in a TDT estate, that way they will supply you with a cable Foxtel box which can be plugged into your existing TV cabling. For more information on Foxtel TDT see both the Foxtel TDT manual here and the Spaun BluBox manual here. How do I think the LBNCo network compares to the nbn? Quite well actually. I like that there is a single POI, and after the estate was upgraded to fibre backhaul I haven’t suffered from congestion. The access to both FTA and Foxtel is also a great additional service too. In the beginning I was quite critical, however after using the network for 18 months I don’t really have any criticism. A major feature in iOS 8 and Yosemite is the ability to connect to an Apple TV whilst not being on the same wireless network. The underlying technology for this is peer-to-peer AirPlay. Peer-to-peer AirPlay adds some great improvements to the old style AirPlay, if both the Apple TV and iOS or Mac support peer-to-peer they will connect this way even if they are both on the same wireless network. This removes the strain of video streaming from networks, and also improves the reliability of AirPlay streaming. Peer-to-peer AirPlay needs no configuration. Mac from 2012 or later, running OS X Yosemite. Some unsupported models can be enabled by using the Continuity Activator. Apple also recommends not using the 149 or 153 5Ghz wireless channels on your infrastructure wireless networks, not using these channels will eliminate any interference between the Apple TVs network and your wireless network. Further information can be found in this great reference page from Apple. During the Yosemite Installation users are prompted to turn on FileVault, this has been causing some issues with some of our Macs. After the installation is complete the user is asked to login to unlock the drive, after they have correctly inputted their password the Mac will begin to boot and display the progress bar, unfortunately on some Macs no matter how long you leave it to boot, the progress bar will not progress further than 50%. The easiest way to bring the Mac back to life is to reboot into Recovery Mode (using Command + R), open Disk Utility and from the File menu select Turn Off Encryption. For whatever reason while in Recovery Mode the disk will not start the decryption progress, now reboot the Mac into Target Disk Mode (hold down T when booting) and using either a Firewire or Thunderbolt cable, plug it into another Mac. When plugging the dead Mac into the other you may be prompted for a password to Unlock the disk, use the users local password for this step. You can now check on the progress of the decryption from terminal by running the diskUtil cs list command. Once the Mac is fully decrypted you will now be able to unplug it and it should boot successfully. Using the passive PoE Mode on the Ubiquiti EdgeSwitch range, I was able to power a Mikrotik RB2011iL. The Mikrotik’s ETH1 port accepts 7 – 31 volts on pins 4, 5 (+), 7 and 8 (-), this matches up with the 24 volts which the Edgeswitch provides on the same pins. This is super handy due to the fact that this Mikrotik model does not have a normal IEC C16 plug and requires an external power supply if you’re not powering via PoE.